The All-on-4 approach to dental implants is a revolution in Implant Dentistry technology. If you are suffering from your dentures or have been told you are not a candidate for traditional implants, All-on-4 may be for you. This procedure is becoming the preferred alternative to a full denture. All-on-4 works by placing back two of the four dental implants at such an angle that the bridge is supported by the implants at the front of the mouth where your jawbone is denser and stronger. If you have been missing teeth for a period of time, it’s quite possible that you have lost some bone density. Previously, patients would have needed to undergo bone graft surgery to restore the lost bone. This can take up to six months fully heal before the dental implants can be placed. All-on-4 is an excellent fast system thanks to its ability to support a full denture (bridge) based only on four titanium implants. These implants act as “pillars” to the bridge that supports the prosthetic teeth, allowing utilising your existing bone and avoiding the need for bone grafts. 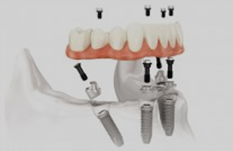 The new All-on-4 technique significantly reduces the number of dental implant that were previously required for securing a complete denture, giving patients the option to restore their smile much more quickly. If you are planning to have All-on-4 Dental Implant, please call for a consultation appointment with Dr. Yousif ….